A second hand book town with its own self-proclaimed "king" has won a competition to find a British twin for the African city of Timbuktu. Hay-on-Wye, in Powys, has beaten off challengers from 52 other towns and cities including York and Liverpool. The search was launched by photographer Stuart Redler last year to mark the start of an exhibition of images from Mali, which is home to Timbuktu. Twinning officials made their decision after five hours of "heated" debate. A delegation from the city now plans to visit Hay later this summer to seal the link. Delegates will also attend receptions at the Houses of Parliament and the Welsh assembly. 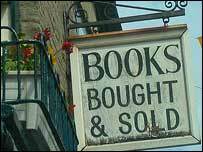 The Welsh book town was shortlisted along with York and Glastonbury in November. Anne Brichto, chair of Hay's twinning committee, said representatives were then asked to visit Timbuktu last month. "Timbuktu is the oldest home of the written word in Africa. It has a large number of private and public libraries housing ancient Arabic and African manuscripts" she added. "Hay-on-Wye is the second-hand book capital of the world, and we lie on exactly the same line of longitude - it was meant to be." Mayor of Timbuktu, Said Mahmoud, welcomed the link with Hay. "I am delighted with the result," he said. "It will bring great benefit to our two communities." 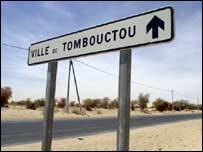 Timbuktu - also spelt as Tombouctou - is already twinned with a Chemnitz in Germany, Saintes in France, Marrakech in Morocco, Kairouan in Tunisia, and Tempe in Arizona, USA. Richard Booth, the self-proclaimed "king of Hay", has helped transform it from a sleepy backwater into a thriving second-hand book economy. The town also attracts thousands to its annual literature and arts festival, which celebrates its 25th anniversary in June.